Setting Prepared quartet: clarinet in Bb, percussion, piano, viola (originally: flute, percussion, piano, viola). Period of creation 2012-04-03 to 28 (1st version); 2012-09-12 to 27 and 2012-12-18 to 2013-01-08 (2nd version); 2014-03-10 to 2014-04-10 and 2014-06-18 to 28 and 2015-05-22 to 29 (3rd version). Commission / occasion 1st version: Commissioned by the flutist Sofia Kayaya (Den) for the children’s music theatre production Leopold von Loppenskjolds Forunderlige Fan­tas­te­ri­er at the Aveny-t Theatre in Copenhagen (Den), funded, amongst others, by KODA (Danish Performing Rights Society) and DKF (Society of Danish Composers) (Den). 2nd version: For the ensemble Collegium Novum Zürich (Sui). 3rd version: Com­mis­sioned by the festival new talents biennale co­logne 2014, funded by the City of Cologne (Cultural Office) (Ger), by the Kunststiftung NRW (Arts Foundation of North Rhine-Westphalia) (Ger) and by the Komponistenes vederlags­fond (The Composers’ Recompense Fund) (Nor). Sandrose is the German term for Sand rose resp. Desert rose crystal in English or Rose des sablesin French. A sand rose is a complex crystalline formation, arranged as an elaborate cluster of rosettes or petal-shaped blades, interlinked and branched in various directions. Chemically, a sand rose is a water-soluble inclusion of grains of sand, embedded in the transparent minerals gypsum or barite. When dissolved in groundwater, the minerals start to crystallize around and among the sand grains, as soon as the water slowly starts to e­vap­o­rate. This process of crystalization and inclusion mainly occurs in certain desert areas, where the water table is located about 1 m below the surface and where the salinity of the brine in the groundwater increases to more than 3 times that of normal sea water. The colour of the sand rose ranges from light ochre to dark brown, depending on the colour of the sand grains. 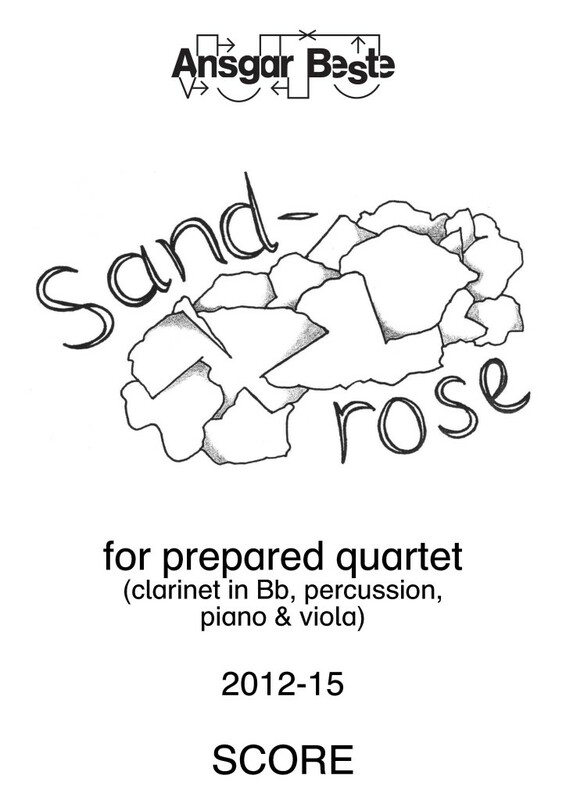 The main idea of the composition Sandrose for four prepared instruments (2012/14) is a re­flec­tion, contemplation or meditation on the different aspects of a sand rose. The dialectical interaction between the elements sand and mineral within the mi­rac­u­lous trans­for­ma­tion process of their physical and chemical reaction is rep­re­­sented by a di­a­lec­tical in­ter­ac­tion be­tween two major sound centres: dry and granular sounds versus more resonant and con­tin­u­ous sounds. The dry sounds may be related to the transformation of the sand: Starting with single attacks (single grains of sand? ), they transform to granular attacks and to repetitive attacks of al ni­en­­te rat­tling (inter­linkage of grains to larger units?) and end up in constant repetitive scraping (complex artistic assemblage of rosettes or petal-shaped blades?). The continuous sounds might stand for the transformation of the mineral: They develop from distorted sounds (viscous brine?) to whistling sounds (glittering sun?) to fluido sounds (e­vap­o­ra­tion?) and finally to gong sounds (crystals?). On the one hand (A), a somewhat mechanic, uniform or monological homogeneity of through-composed fermatas or oases of calm (4,5 min). They focus on, filter out or freeze one sound type at a time. These sound types rotate in (rhythmically irregular) circles through the en­sem­ble. And on the other hand (B), a dynamic, conflictual or dialectic heterogeneity and complexity (7,5 min). A refined network of metric and syntactical behaviours (upbeats, downbeats and sustained resonances with different hierarchies) results in a constant organ point: Without interruptions, there is always some sound going on. The homogeneous passages alternate between the two sound centres starting with dry and granular sounds, whereas the heterogenous counterparts combine sounds from both sound centres simultaneously. In the course of the dialectic process (B), an “artificial” rhythmical quotation, built up from incisive rhyth­mic cells of famous works by Mozart, Beethoven and Brahms, increasingly assumes con­crete shape. This gradual rhythmic evolution (“dal niente”) can be compared to the e­mer­gence of the concrete shape of the sand rose from the still amorphous ingredients of sand and mineral. The overall form consists of 7 cycles, each starting with A followed by B. In cycle 1, A and B start with equal duration. Subsequently, A is augmented to one and a half times and B is augmented to three times its original length. The growing dominance of B stands for the complexity of the resulting shape of the sand rose. Athelas Interview 2014 Ansgar Beste on Sandrose by Mads Brammer (Den) on YouTube.com at 04.47 h.
8,33% Selection by the Oslo Sinfonietta (Nor) for a concert at the Oslo Chamber Music Festival 2014, 4/48 (2014-06). duration: 2 min 49 sec. duration: 2 min 23 sec.